April 18, this is big. 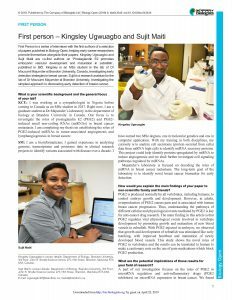 Graduate student, Kingsley, and Bioinformatician, Sujit, were interviewed by the international peer-reviewed scientific journal “Biology Open” for their publication. The section named as “First Person”. This is the best international honor and recognition for a trainee. Congratulations!!!! 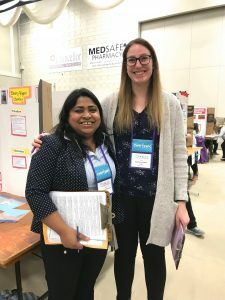 April 9, Majumder Lab participated in the Western Manitoba Science Fair (WMSF), held at HLC, Brandon University. 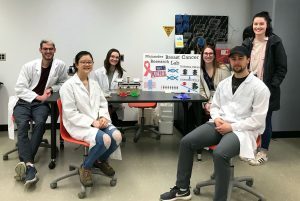 April 9, we also participated in the open house at the Department of Biology after WMSF, where we displayed our breast cancer research program at BU to high school kids to encourage them to do science at Brandon University after they finish high school. 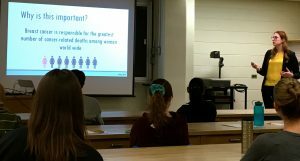 April 2, Honours student Stephanie Hunter successfully defended her thesis. Congratulations Steph !!! 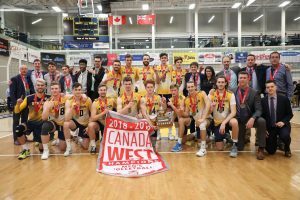 March 8, BU Bobcats men’s volleyball team took the Canada West title in five sets on Friday. Now we’re headed to nationals. 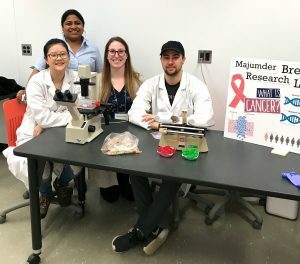 Big Congratulations to Brady Nault, a research student at Majumder lab. He is a star player to watch !!! We are proud of you. Best wishes for the nationals Brady !!! A big congratulations to Honours student Stephanie Hunter. 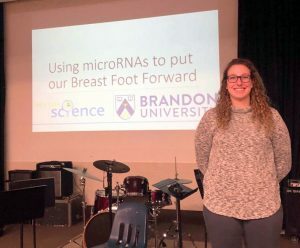 Stephanie is one of the outstanding students to receive honor at Brandon University for her contribution to academics, research, sports and community services. You deserve this honor Steph. Well done !!!! Could a simple blood test be able to detect breast cancer? Emma Gervin, Bonita Shin, Danielle Larocque, and Riley Feser. We shall rock together !!! 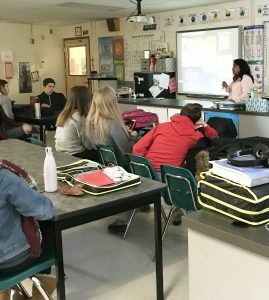 Dr. Majumder giving science seminar to grade twelve students at MacGregor Collegiate Institute & Neelin High School. 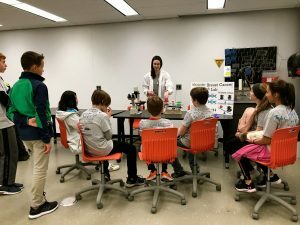 Stephanie, giving science seminar at Crocus Plains Regional Secondary School. October 13th, A Big Congratulations!!! 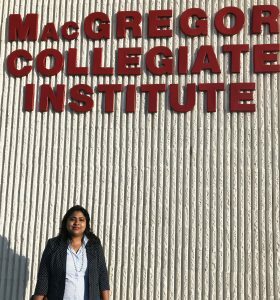 to Kingsley, MSC student at Majumder Lab for Winning Brandon University 3MT (three-minute thesis) competition. The competition was held during BU’s Homecoming Event “New Beginnings Conference: A Community Connective Research Conference“. June 14, Thank you, Sharon Young, VP Canadian Breast Cancer Network to visit our lab and sharing her story of battle against breast cancer. 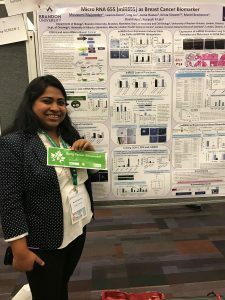 Trainees got a wonderful opportunity to explain their research impact on breast cancer early detection. 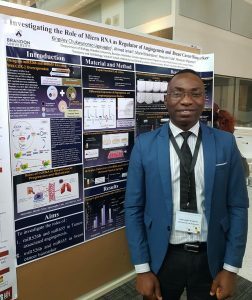 June 11, MSc student Kingsley Ugwuagbo from Majumder Lab presenting a poster at the Canadian Student Health Research Forum at Winnipeg. 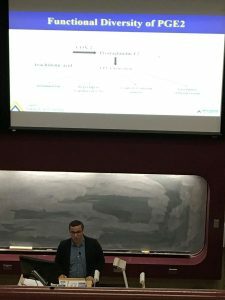 He competed with graduate and postdocs in the Manitoba competition and won an award. Way to go Kingsley !!! May 29, Cancer Care Manitoba Research Day at the University of Manitoba. 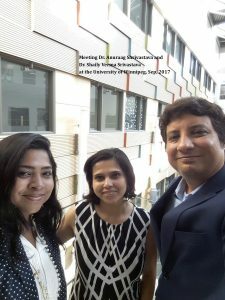 Entire Majumder Lab from Biology attended the program. 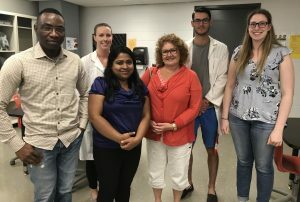 In the photo below from left Dr. Charette from Chemistry, Trent (Charette Lab), Brady and Ahmed (Majumder Lab), Dr. Majumder, Kingsley and Stephanie (Majumder lab), Alice (Charette Lab), Alisha (Chen Lab), Courtney (Charette Lab). 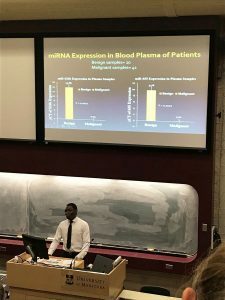 May 29, CCMB research Day, Dr. Majumder was an invited judge in the program and two students from the lab Ahmed and Kingsley giving oral presentations. Congratulations!!! Ahmed and Kingsley. April 30, Majumder Lab happy to welcome and thanks Patrice Colville, a retired fellow of Canadian Armed Forces, who decided to volunteer in Majumder lab in between of her EMS services. 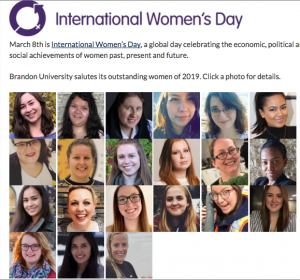 She is an undergraduate student at Brandon University. Someone who can hold both gun and a pipette. 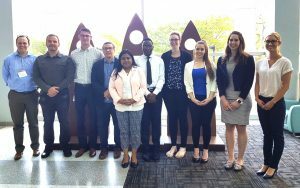 April 23, two undergraduate BU star athletes Stephanie and Brady join Majumder lab with NSERC-USRA Scholarships. Congratulations !!!! Very proud of you. April 9, It’s a very busy day at Majumder Lab. Majumder Lab welcomes Dr. Anuraag Shrivastav and Dr. Shailey Verma Shrivastav from the University of Winnipeg to meet our lab, discuss research projects with our students and finding potential collaboration opportunities. We also proudly host Dr. Anuraag Shrivastav as the guest speaker in the Brandon University Science Seminar Series 2017-2018. 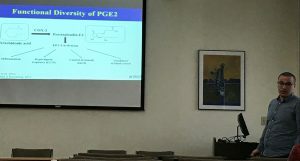 April 9, Undergraduate Research Assistant Ahmed Omar presenting his research project in Majumder Lab at the Senior Colloquium at Louis Riel Room at Brandon University. Well done Ahmed !!! April 6, Thank you Research Manitoba. 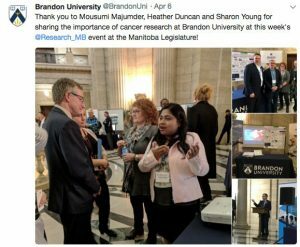 Majumder Lab is very honored to get invited to represent Brandon University at the Legislature Building and meet Enterprise Minister Hon. 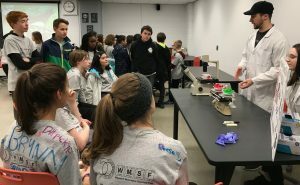 Mr. Pedersen at Winnipeg at the event “Manitoba: Home of world-class research” organized by Research Manitoba. A very special thanks to the breast patient survivor Ms. Sharon Young (VP, Canadian Breast Cancer Network) to join our team and explaining the importance of our research to the house of chambers. 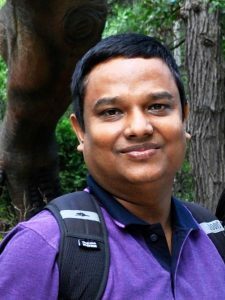 April 1, finally, we have a Bioinformatician in Majumder lab. Sujit Maiti joins the lab to conduct high throughput proteome data analysis. Welcome, Sujit !!! 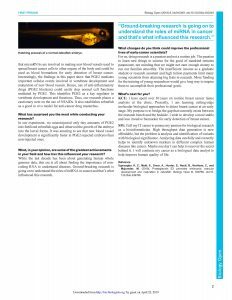 BU faculty featured with top prairie researchers. 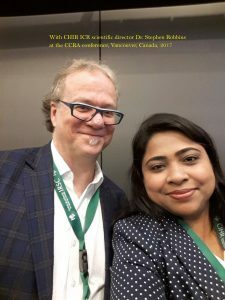 November 5, CIHR-ICR Early Career Research Program Award given by Canadian Institutes of Health Research during Canadian Cancer Research Alliance Meeting 2017, in Vancouver, Canada. 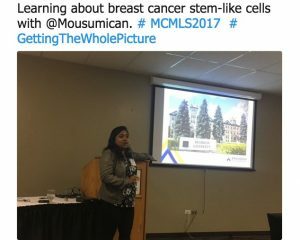 October 5, Invited talk at the Manitoba Congress of Medical Laboratory Sciences (MCMLS) meetings at the Brandon Keystone Centre. September 29, Invited talk at the Department of Biology, University of Winnipeg. September 12, New Graduate Student in the lab. Welcome!!!! Ugwuagbo Kingsley Chukwunonso. 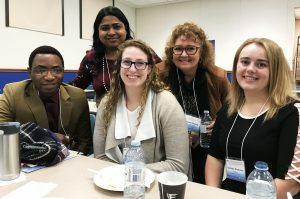 June 12, Dr. Majumder representing Brandon University at the 1st Terry Fox Research Institute (TFRI) Alberta and Prairie Node meeting. 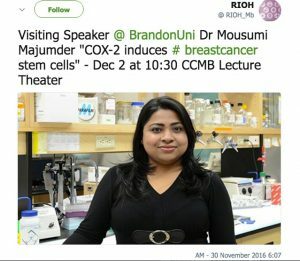 December 2, Dr. Majumder invited as guest speaker at the Research Institute of Oncology and Hematology, Cancer Care Manitoba, Manitoba, Canada.